SCT3700 Series are compatible with Molex EconoLatch 3.7mm pitch series wire to wire connectors. Scondar offers SCT3700 Series as a replacement and cheaper alternative of Molex EconoLatch 3.7mm pitch wire-to-wire connector in a complete package including the male housing, female/receptacle housing, female terminal and male terminal, all manufactured with precision-fitting and durability ensuring accurate mating in electronic devices. Molex EconoLatch supports up to 11.5A of current per circuit allowing quick swapping of wired terminals for disruption-free operations in consumer, automotive and industrial applications. Scondar’s economy power connectors are designed with up to 9 positions, so your product can reliably deliver power even when space is limited. EconoLatch is truly an state-of-art connector as it has a distinct feature of configuring identical circuit connections in a single wire harness while maintaining male and female parts in proper order without mismating. This is especially common when multiple polarized housings are involved in one harness. The crimp are designed with a circular pattern allowing flexible orientation options for quick insertion and assembly. To facilitate a secure connection without dropouts, a positive locking mechanism feature greatly enhances wire-to-wire mating connections. This feature of the terminal locking lances is notable for providing contact stability when inserted in the connector housing. The dimpled terminals are also substantial in providing enhanced contact reliability and optimized electrical performance. 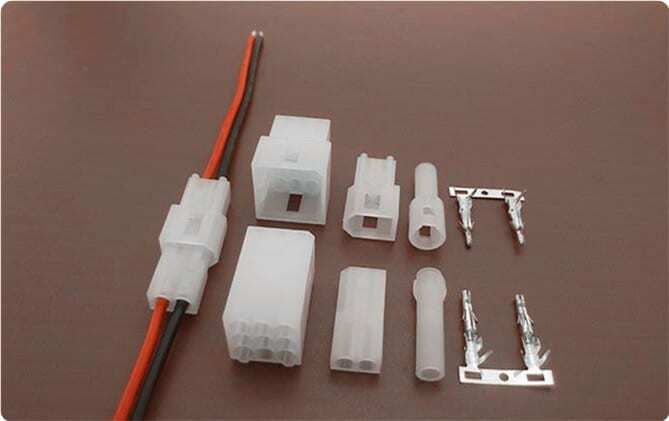 You can expect that your wire-to-wire connector package is undisturbed during the trip and has maintained its vitality even during your production stages, which is why a lot of our customers has raved about our product for both cheaply-priced and, at the same time, resembles the Molex EconoLatch 3.7mm pitch wire-to-wire product in performance and quality.